Bears, mountain lions, and sasquatches are all apex predators, meaning that they are at the top of the food chain for their habitat. 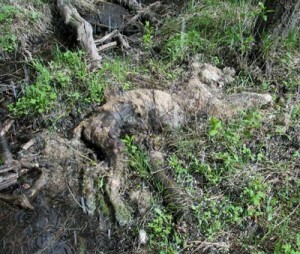 Their only real predators are humans, and occasionally one can find remnants of a hunted or poached bear or cougar. Naturally dead apex predators are almost never found. So, by putting themselves in inaccessible areas for safety reasons, the animal effectively hid itself. The bones wouldn’t last long anyways. Rodents are by far the most common mammals in North American forests, and they eat bones for the calcium content. Bone-eating rodents include wood rats, the various mouse species, porcupines, and rabbits (although bunnies are not technically rodents, but lagomorphs). So the bones are dispersed and recycled (or digested). This mountain lion was reportedly only dead for a few days. I was thinking about these dispersed bones recently, and it occurred to me that if someone was walking off trail and ran across a femur that was two or three feet long, that person probably wouldn’t consider that it could be a bigfoot bone. They would probably assume it was an elk or some other large animal’s bone. (This makes a lot of sense, because it probably would be from an elk or some other large animal.) However, it would be very unlikely that the person would save the bone and give it to an appropriate expert to identify the animal species it came from. So, it is entirely possible that bigfoot bones have been discovered and ignored. So, how long would it take for no sign of the corpse to exist, including bones? I don’t know, but I have heard that a full-grown Asian elephant will be totally gone in as little as four months. The rate of decomposition is explained by Casper’s Law (or Ratio): if all other factors are equal, then, when there is free access of air a body decomposes twice as fast than if immersed in water and eight times faster than if buried in earth. Any dead sasquatch (or other apex predator) would be fully exposed to the air, thus decomposing the fastest. In summary, we would not expect to find the bones of any naturally dead apex predators. That being said, I did speak to an owl-hooter in Northern California who said he came across a naturally dead bear. It was poking out of a hide-hole under a pile of fallen logs. This further supports my hypothesis that animals hide themselves upon their demise. Just because we are unlikely to find a naturally dead sasquatch, that doesn’t mean we shouldn’t still try. I like to poke around in the thick brush or under likely cover for just such a find. I believe under large rocks that form natural caves is another excellent choice. However, be aware that it is even more likely that you could find a live apex predator, so be careful.